Box elder, 8” diameter x 4” tall. This is the third green bowl I have turned, and the end grain is killing me! Between the Hunter #4 and a bowl scraper, I got a very smooth finish on edge grain even before sanding, but the end grain is not just a bit rough, it is ‘open’. I appreciate a natural look to the finished product of green turning, but this amount of roughness is detracting from the finished product, IMO. Any tips for reducing this issue and getting smoother results on green turnings? After finishing this bowl, I thought about using a shellac sanding sealer as a first finishing step – thoughts? I don’t turn, so when you say green, you mean you are working it prior to drying? I was under the impression that green turning was more of a roughing step then the part was allowed to dry fully before final working. The product you show appears to be a finished bowl, so I guess I really don’t know anything about wood turning. 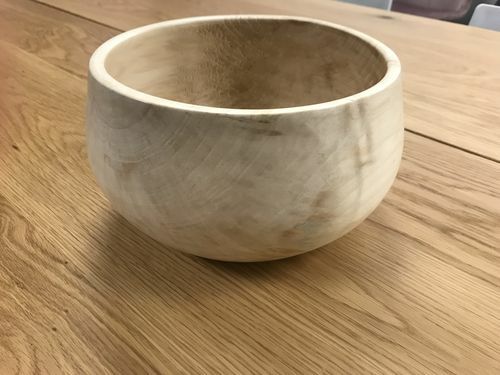 @BlueRidgeDog – correct; this bowl started as a piece of box elder that was cut from a standing tree 3 – 4 months ago (by the instructor of a bowl turning class I took). The end grain was sealed with Anchorseal to greatly slow drying. I don’t have a moisture meter, but the wood definitely had a feeling of slight dampness when I was turning it. With two previous bowls, I rough turned the bowl blanks when the wood was WET – like less than a week from being cut off a living tree. The wood was so we that the chips rusted my lathe bed. I turned to a wall thickness of ~1.5”, then coated the blank in Anchorseal to slow drying, and set it aside for several months. I then turned it to final form and wall thickness. In a green turning class this past January, we turned to final thickness and form on green wood. The instructor does the majority of his turning this way, and he does some beautiful work. The finish slows drying and reduces cracking and warping. Very nice shape on your bowl. You can dry your bowls in heavy paper bags left in a cool place to avoid extreme warpage and cracking. I never used any sealer and never lost a bowl with that method, but sealer is a time honored method too. You can turn green wood to a finished vessel as long as the walls and bottom are the same thickness and the it is an end grain turning. Sometimes you will get some cracks in the bottom, but a little super glue there on the outside bottom is usually enough to stop checking or even eliminate it entirely if it’s done early enough. I think if you use HSS steel more often you will find that you can sharpen to suit your needs and get better definition on coves, and beads, etc. I know a lot of people love their carbide tools, but I doubt they are doing any challenging turning with them. They are probably great for segmented turnings though. Just my personal opinion. Mike – thank you for the compliment on shape. The recipient of the bowl was thrilled. I am finding that my Hunter carbide tools, which have round bars and cupped carbide cutters have some of the advantages of carbide AND HSS. No sharpening needed, but you can present the cutter to the work in a variety of ways. Of course, no carbide can be customized like HSS can.